The spacious house is in a very large garden with cherry, plum, peach and apple trees,flowers and natural swimming pond (10x3m swimming space). The pool is shared with a second holiday home next door (see property 1019756 "Cozy cottage near Munich"). A large number of patios and terraces are available for outdoor dining, sunbathing or just unwinding. The house is furnished with antiques and is eco-friendly. Musicians are very welcome to practice during their stay. A tuned piano is available in the living room. A large library with English and German books, games, children's books and comics is in the house. The owners library of over 450 DVD and 40 videos may be used as well. We´d be happy to help you with suggestions and information on Bavarian culture, sightseeing and answer any questions you may have. 3 bedrooms, 2 bathrooms, library, living room, fully equipped kitchen, washing machine, freezer. Türkenfeld (2km) has a shop with fresh organic products, a large supermarket, bakeries, a bavarian & an italian Restaurant. toilet, shower, bidet, on the groundflloor. Not ensuite with the bedrooms. Bathroom 1 with bathtub as well as shower, toilet and bidet adjoining bedroom 1 on the first floor. Bathroom 2 has a washbasin, semicircular shower-enclosure and toilet and on the first floor adjoining bedroom 2. Bathroom 3 is on the the ground floor, ensuite with bedroom 3 and has underfloor heating, washbasin, toilet and shower enclosure. Bathroom 4 has a shower, toilet and bidet is on the ground floor and not adjoining any of the bedrooms. Large kitchen with part stone and part wooden antique flooring. Weekly house cleaning is included in the rental price. The house has central heating added to this the kitchen has a closed fireplace which heats the living room as well which is cosy on cool days or in winter. A traditional Bavarian breakfast can be served if required. We had a great stay at the farmhouse. The house itself was charming, cosy and roomy at the same time, but with all of the modern conveniences. Especially loved the library, and the kids enjoyed the games and exploring the garden. Sabeeka and Hans were terrific hosts - they had treats for us on arrival, provided help when needed and kindly set us up with bikes. The area around the house is just beautiful - rolling hill, forests, lakes - and a view of the Alps on a clear day. All in all a wonderful experience not to be forgotten. We wished we could have stayed longer! Wir haben uns in dem sauberen und liebevoll eingerichtetem Ferienhaus sehr wohl gefühlt. Es fehlte uns nichts, insbesondere die Küche war toll ausgestattet mit Gewürzen, Tee , Kaffee....Unseren mitgereisten Austauschschülern aus Kolumbien und Neuseeland wollten wir ein typisches Haus mit Atmosphäre bieten, was sehr gut angekommen ist .Mit 6 Personen hatten wir ausreichend Platz. Aufgrund des Märzwetters konnten wir den wunderschönen Garten gar nicht nutzen, dafür aber um so mehr die Nähe zu München .Auch Kloster Andechs , Ammersee und die Königsschlösser sollte man nicht verpassen, kurz: das Ferienhaus ist ein optimaler Ausgangspunkt für viele schöne Unternehmungen mit sehr netten und hilfsbereiten Gastgebern !! We really loved this farmhouse - big rooms, comfy beds and beautiful old furniture appropriate to the building. The garden was really nice, with trees, wild strawberries, herbs and spring flowers. Breakfast on the terrace in the sun was just so relaxing too. The children thought it was the best place in the world and didn't want to leave. But above all, Sabeeka and her family were inredibly helpful and friendly and made our stay brilliant. Thanks all! It was an excellent stay. The house is wonderful and permitted us taking so much advantage of the nice area and the proximity of Munich. Thank you. We had a lovely three days in this gorgeous farmhouse outside Munich. It is very pretty (just like the photographs! ), well equipped and clean. The owners are charming and helpful and could not have done more to make us feel at home. We enjoyed a day trip to the city (easy 30 minute train ride from the neighbouring village) and two days in the countryside, exploring the lovely lakes nearby. We will definitely return to enjoy more of the house itself, especially the library and the gorgeous pool. We can heartily recommend it for a family getaway, and for a great combination of city and country. Thank you for your kind words-you were wonderful guests and are always welcome to return for another holiday! We had a truly superb time in Sabeeka and Hans' holiday house in Zankenhausen. We were made to feel extremely welcome on arrival and Sabeeka and Hans were on hand for any queries during the week. The house has enormous character and we very much enjoyed staying there. There is an enormous amount to do in the surrounding area - the Alps are a couple of hours drive away and afford excellent walking and breathtaking scenery. The castles at Neuchswanstein are touristy but well worth a visit. Closer at hand are several lakes, the closest being Amersee. These are again very pretty and in summer I understand there are lots of watersports on offer. It is very easy to get into Munich - there is a very regular train service from Turkenfeld which takes your right into the centre. All in all it is a great place to go for a family holiday and we thoroughly recommend it!! 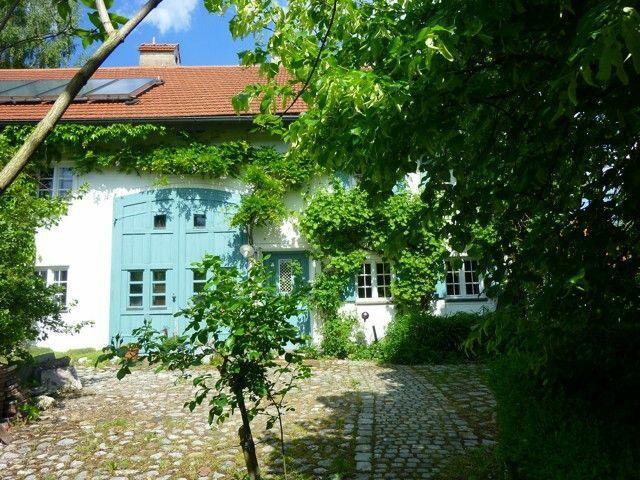 Large 400-year old restored Bavarian farmhouse with natural swimming pond in gorgeous countryside. Situated on the south slope above the Ammersee with wonderful views of the lake and the Alps in the background. Besides the Ammersee, the 3 further lakes - Wörthsee, Pilsensee and the famous Starnbergersee- are close by. Various water sports such as windsurfing, sailing or swimming can be enjoyed here. Weather permitting, the smaller lakes are ideal for ice skating in winter. The Area is perfect for walking, hiking,cycling or just relaxing. There are plenty of cycling routes (maps are available in the cottage). A number of ski resorts in the Alps can be reached such as Garmisch, the Zugspitze, Mittenwald,Lenggries, Spitzing, Brauneck, Achenkirch and Leermoos. The historic monastery and pilgrimage chapel of Andechs - world famous for its strong beer - is a 25 min drive away. Further beautiful churches such as the baroque church in Diessen are nearby.The location is perfect for exploring historic cities such as Munich, Augsburg, Dachau and Landberg or mountain towns such as Garmisch or Altötting as well as the famous castles of Neuschwanstein and Linderhof. Slightly further away but easily reached (by train as well) are for example the cities of Salzburg or Nürnberg. The cottage is located 30 km outside of Munich. A train station is 2 km from the village and a regular train service can be used to comfortably reach the Munich city center. Ski: A large variety of ski resorts can easily be reached such as Garmisch, Lenggries, Mittenwald, Achenkirch, Brauneck, Leermoos, Spitzing, Seefeld. Please note that these rates apply for upto 4 persons. Each additional person will be charged a minimum of 33,17€ per night. Towels and Bedlinen are provided. For a stay of less than 3 nights an additional cleaning charge of 150 Euro will be added. For a stay of 3 nights or more there is no extra cleaning charge. Der Grundpreis gilt für bis zur 4 Personen. Jede zusätzliche Person zahlt mindestens 33,17€ pro Nacht. Handtücher, Bettwäsche Heizung, Wasser, Strom sind im Preis inbegriffen Bei einen Aufenthalt von weniger als 3 Nächte fällt eine Zusatzgebühr von 150€ für die Endreinigung an. Bei einem Aufenthalt ab 3 Nächte fallen keine Zusatzgebühren für die Endreinigung an.